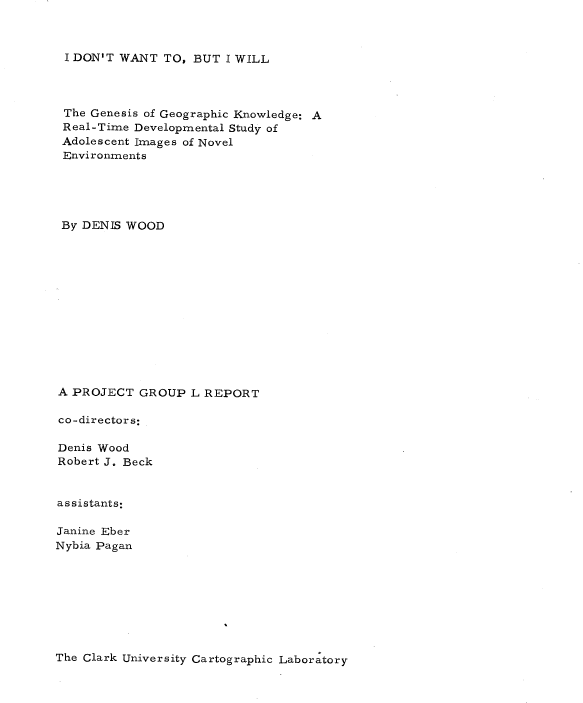 Throughout graduate school I heard tales of the Denis Wood’s outrageous dissertation, curiously titled I Don’t Want To But I Will. Of particular interest are the scathing Acknowledgments, where Denis took his advisors to task. A worn copy of the Acknowledgments was passed among grad students as a bit of intellectual contraband. But the content was what was most important. It’s a crazy dissertation. It’s about maps, mental maps, getting kicked off a bus, psychogeography, single element veridicality analysis, Europe, cartography, Kevin Lynch, passed-out subjects, Peter Gould, psychogeomorphology, the Shirelles, and the invention of “Environmental a” – a language for mapping. Among other things. It is driving the wrong way down the one-way-street of academia. The dissertation was printed in a very limited number by the Clark University Cartographic Laboratory. Denis has recently made available a PDF of this never-really-in-print gem. I have reproduced Denis’ comments on the different chapters in the dissertation, along with links to the entire document and each chapter, from his web pages (here). Download it by chapters (below) or as a single 685-page document. The front matter, including the dedication (by the Shirelles), the notorious acknowledgements (my unhelpful faculty and the rare humans), credits (as in a movie), and Introduction (opening with Ed’s story, a night watchman on the edge of Castle Hill park, and going on to talk about psychogeography and various kinds of mental maps). PART I: Psyching Up for the Trip (a sort of philosophy section). Chapter 1: The Beginning of All This (“How would you like to go to Europe this summer?” Bob Beck asked me; and the design of the study). Chapter 2: Some Relevant Ancestors (individual, consensual, and standard mental maps, Peter Gould, and Kevin Lynch; or, what passes in the trade for the “review of the literature”). Chapter 3: The Study Tools (Bob and I invent Environmental a, a mapping language). Chapter 4: The Study Starts Before the Trip (long-distance training in Environmental a and the “predictive morphologies” of London, Rome, and Paris). PART II: The Trip or Denis’ Inferno (the novelesque part). Chapter 5: What Others Have Thought of Travel (a bouquet of quotations about travel). Chapter 6: A Terminal Wet Towel (Bob and I meet the Group L kids at Kennedy and what happens after that). Chapter 7: A Day on a Tour (the first day: I will show you blood in a handful of data). Chapter 8: Down and Out in London (the week in London). Chapter 9: Parnassus in Innsbruck (and one of the kids ODs or, well, just passes out). Chapter 10: When in Rome, Don’t Do as I Did (in which I get drunk and kicked off the bus). Chapter 11: Kid’s Lib, or Aristocracy in Exile (in which the kids take control of the research and collect all the Paris data). Chapter 12: Old Tours Never Die, They Just Fade Away (in which, months later, a bunch of us get together again for a weekend in New York). PART III: After the Trip; or What’s in Klein’s Bottle (the “science” part of the dissertation). Chapter 13: Tripping and Tracing through the Data (trace events; or the crumbs of the cookies left for Santa). Chapter 14: The Content of the Tour (applying Lynchian content analysis to the traces left by the Group L kids). Chapter 15: Travel Connections (or trying to wrap graph theory around the kids sketch maps). Chapter 16: Hanging Out the Rivers to Dry (trying to read the maps through something I called single element veridicality analysis). Chapter 17: Pagan Curves, Lincoln Variations, and Eber Aberrations (or the quest for the warped space of human experience and psychogeomorphology). Chapter 18: Bigger is Better – Or Worse (you draw what you feel; or, the analysis of the areal and feelin overlays). Chapter 19: You Are Where You Sit (the analysis of the bus seating charts and their relation to the maps; or, Fixers, Mixers, and Rangers). I stumbled on your page today trolling for some cartography resources, and found this beauty. I am so excited to read this dissertation! Thank you for sharing it with us all. So, recommended reading, or an oddity, is it? Read the Acknowledgments, at least. What a refreshing change from dreary local government issue GI policy and protocol. An excellent resource for the post lunch slump and when another viewshed analysis scenario just doesn’t cut it. Thanks for posting. So, is makingmaps … over? Do I unbookmark it? Not over. Just busy with other projects. Starting to work on a 3rd edition of the book in the spring and will resume blog postings soon. John K.